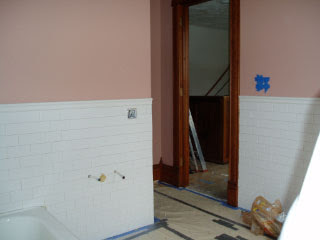 So here are photos of what the down stairs bathroom currently looks like. 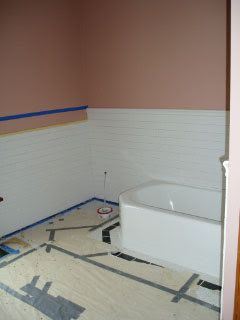 You'll notice that it did not get finished by Molly's birth or even her first birthday. No one is surprised. 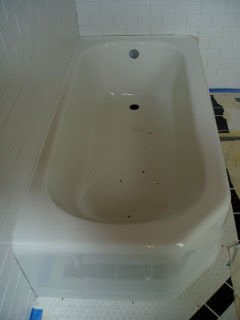 We had the tub refinished. Unfortunately, I cannot find any before pictures, but trust me those of you who didn't see it. It was bad. The little spots you see now are lady bugs. 8 months pregnant=don't bend unless absolutely necessary. We are very happy with how it turned out and would recommend it to others. But in the back of my mind there is still that little voice that reminds me of the horror stories I've heard about it all falling off one year later. So maybe I will wait a few more months before singing its praises. I am no longer the optimistic/trusting person I was four years ago because of certain run-ins with contractors on this house (can't talk about it yet-should be resolved soon though -sigh-).